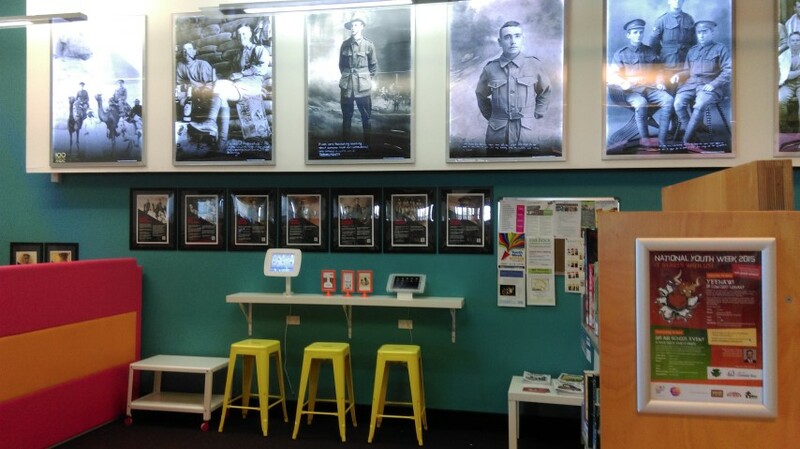 To coincide with the centenary of Anzac, Five Dock Library is displaying photographs and memorabilia of local soldiers who served in the First World War. A highlight of the display are videos produced as part of the ‘More than just a name’ project which can be viewed on the touch top table in the Young Adult area. The videos were prepared by local students from Five Dock Public School, Concord Public School and Concord High School. The Young Adult area has photographs of some of the soldiers in light boxes. The mixture of formal studio photographs and informal images are complemented by panels which tell their stories. The display continues at Five Dock Library until the end of April. The ‘More than just a name’ videos can also be viewed online. Some of the videos will also be shown, along with the film War Horse, at Anzac Remembrance Under the Stars, at St Alban’s Church Grounds, Great North Road, 17 April 2015, 6-9.30pm. 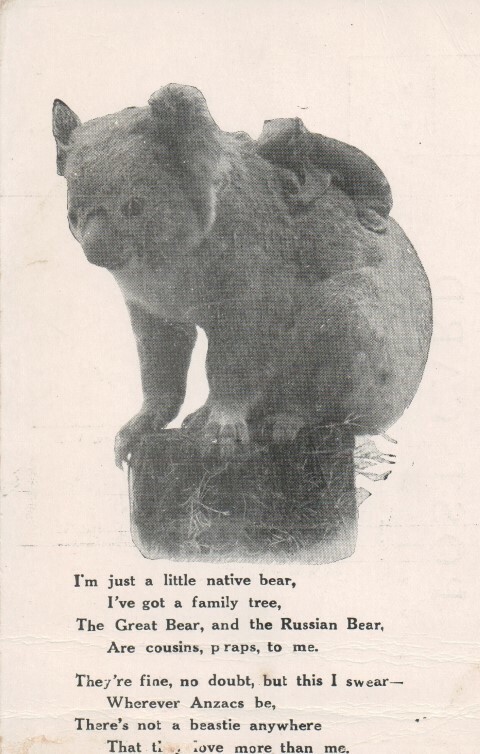 Postcards and letters with news of home were important for soldiers during the First World War. Likewise, those at home treasured messages received from their loved ones on active service, as demonstrated by the album kept by Margaret Jeffery, in which each piece of correspondence from her two sons and nephew was lovingly preserved. 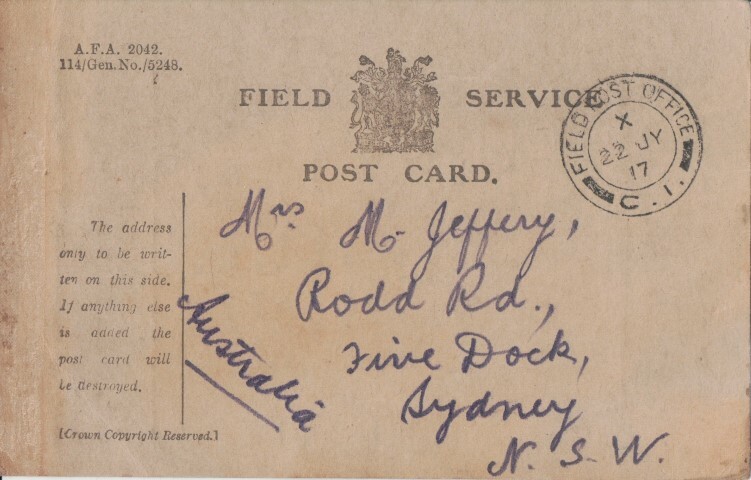 On the back of one postcard, Private Henry (Harry) Jeffery writes to his family in Five Dock,’I have not had any letters for sometime now. We all feel glad when we come off parade and find a letter on the table for us. If a chap does not get a letter and sees one of his mates with one, he says lucky beggar’. Mail during the First World War was censored so as to keep any operational details secret. 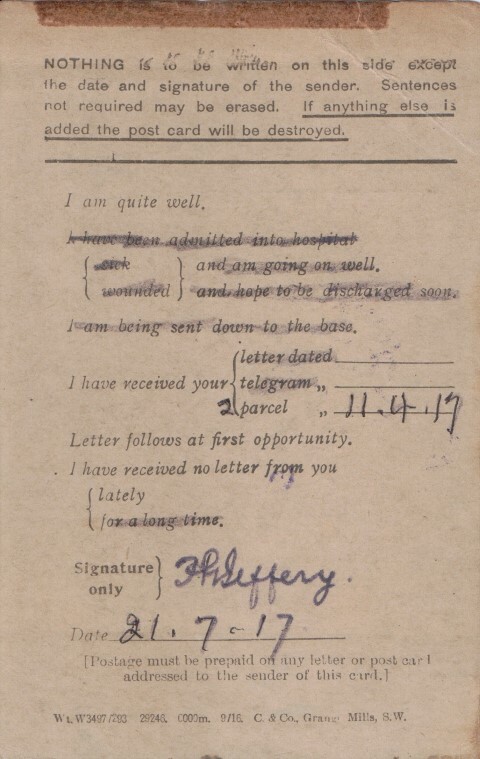 At the Front, communication was reduced to filling in a form letter like the one above sent by Harry Jeffery to his mother. There were ways of getting around the censor. Harry noted in one letter to his family that ‘at one port we called at soldiers threw letters to the people on the wharf to post. I am going to do the same next time.’ While training in Britain, he wrote a long letter to his family about the journey from Sydney to Portsmouth and posted it while on leave away from the base, to avoid the censor. The postcard, above, was filled in using an indelible pencil which had a purple dye mixed in with the graphite. Indelible pencils were popular as it meant that a soldier did not need to carry a pen and ink. As the name suggests the writing could not be rubbed out (unless a censor used his indelible pencil to cross out the writing). The Jeffery Album contains a fascinating and touching series of letters from Tom Evans to Margaret Jeffery at Five Dock. While the first letter was addressed formally to ‘Mrs Jeffery and family’, it was not long before Tom was addressing Mrs Jeffery as ‘Mother’ and he continued to send letters and cards until the war ended. 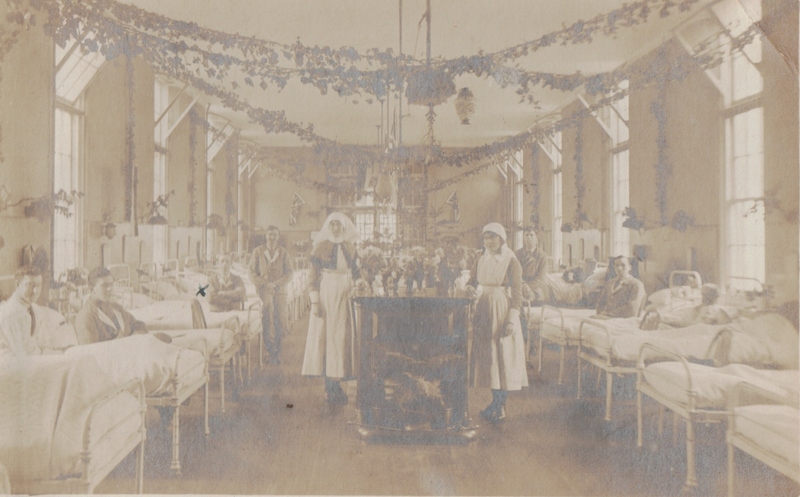 The photograph show Tom (marked with an X) in Queen Alexandria Hospital, Cosham, Portsmouth in January 1919. During the First World War, those at ‘home’ did what they could to show support for the soldiers on active duty. 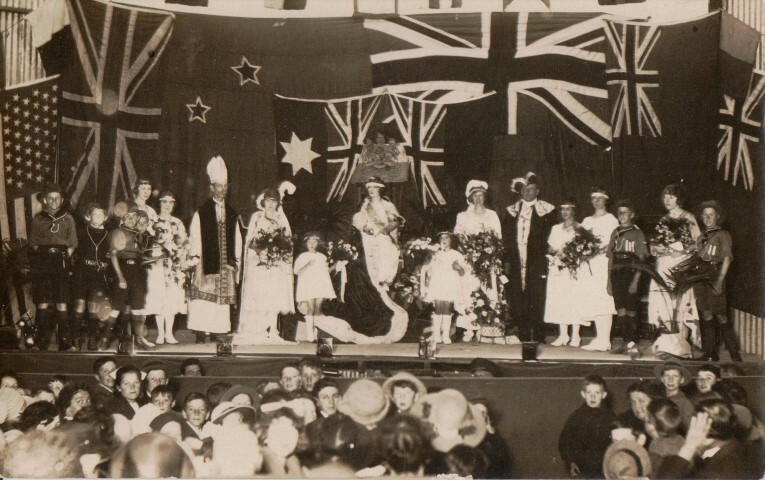 There were a variety of fundraising activities, such as the Grand Patriotic Carnival at Five Dock. Money raised would often be used to provide ‘comforts’ (little gifts) for the soldiers. Women and girls would knit socks for the soldiers, often including notes of support and encouragement to the soldiers. Bob Jeffery of Five Dock received a parcel at Christmas 1916 which included a pudding, jam and chocolates. Bob wrote back to nine year old Ethel Elliot who had sent the parcel and they continued writing to each other for the rest of their lives, although they never met until 1972. 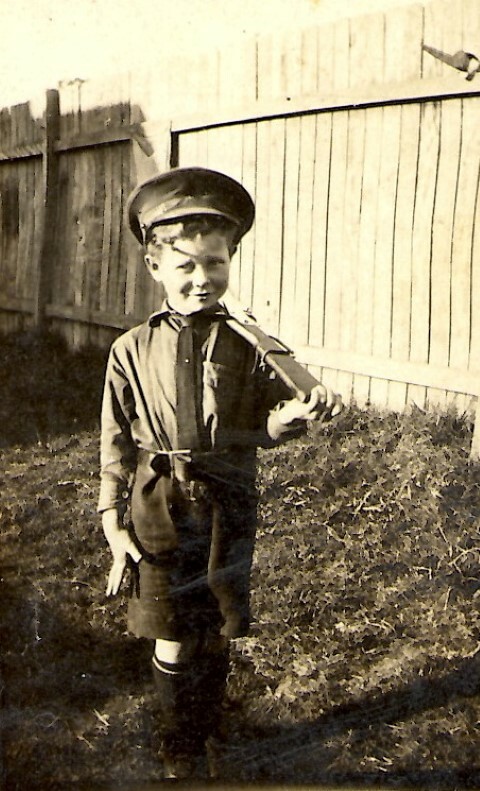 It is not surprising that during the First World War young boys would play at being soldiers. The photograph shows George Jeffery playing soldiers in the backyard of his home at Rodd Road, Five Dock, about 1916. He was undoubtedly emulating his older brothers, Private Henry (Harry) Jeffery and Private Robert (Bob) Jeffery who served in the First World War. His brothers were not much more than boys themselves. Harry Jeffery first enlisted when he was 17 but was discharged due to pneumonia and being underage. He re-enlisted when he was 18. Bob was even younger. He was only 15 years and 8 months when he joined up. Another photograph in our digital collection, ‘Canada Bay Connections’, shows the young son of the Grace family of Abbotsford House on his rocking horse apparently pretending to be a Light Horse soldier with an emu plume in his hat, ‘lance’ and flag. 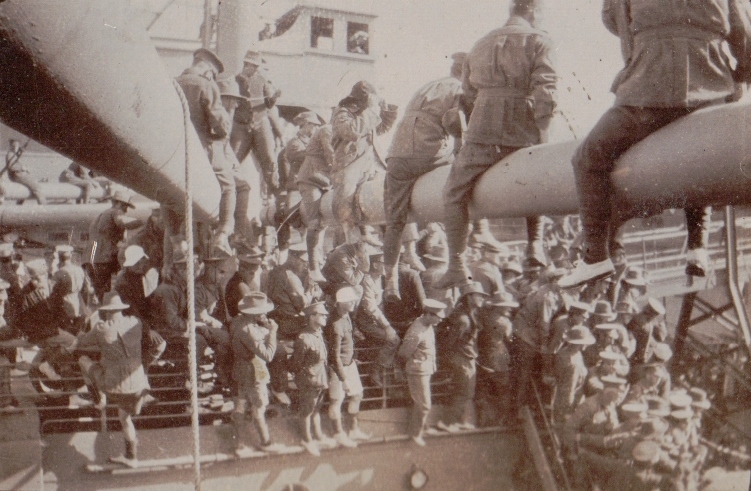 Following Australia’s commitment of troops to the First World War, the Government leased 28 ships from various sources to transport soldiers, horses and equipment for active service abroad. Amongst photographs in the Jeffery Album, which was donated to Local Studies last year, is one of HMAT (His Majesty’s Australian Transport) A14 Euripides, above, probably taken when the ship left Sydney on the 9 September 1916. The photographer, Private Henry (Harry) Jeffery of Five Dock was on the ship. There’s another photograph of him in the album on board HMAT Euripides, together with a newspaper clipping showing Harry and his fellow soldiers excercising. HMAT Euripides took seven weeks to reach Plymouth. There was a stopover at Durban where, Harry noted in a letter, ‘[had] a good feed and we needed it too after the tack on board consisting of frozen meat … no vegetables at all only spuds and haricot beans’. Otherwise, he drily noted, ‘all we saw on the way over was a whale now and again’. In the early 1950s the Cabarita Ladies’ Amateur Swimming Club had a big impact on Australian women’s swimming. The club was founded by Lesley Thicknesse who had been a diver at the Empire (now Commonwealth) Games in London in 1934. Her three daughters Janet, Val and Pam along with Lorraine and Thelma Crapp were among the first members of the club. Based at Cabarita Baths (now Cabarita Swimming Centre), six members of the club were part of the Australian team at the 1956 Olympic Games in Melbourne. In view of the regimens of today’s elite swimmers, it’s interesting to reflect on training 1950s style. Winter calisthenics classes were held on the backyard lawn of the Thicknesse family home. Participants were reminded to ‘bring a rug or small blanket’. However, training was under the guidance of Frank Guthrie, one of the great coaches of the period, who helped Lorraine Crapp achieve enormous success in the pool. 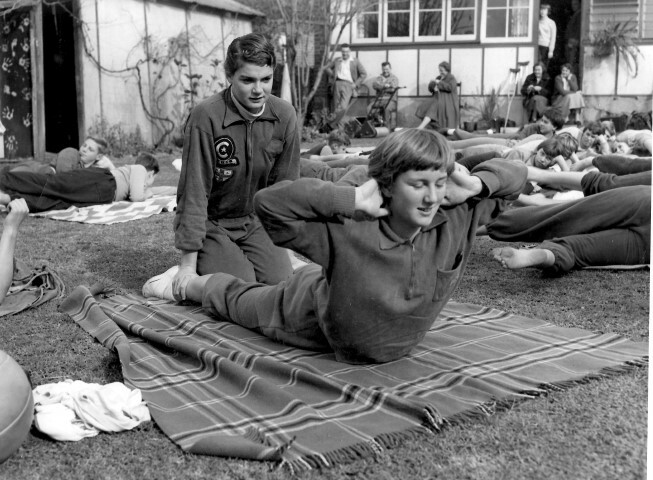 The photograph shows Pat Huntingford and Lorraine Crapp participating in a Cabarita Ladies’ Amateur Swimming Club calisthenics class in 1955. City of Canada Bay is hosting a family fun day at Bayview Park, Concord on Saturday, 21 March 2015, 12noon – 4pm as part of the Parramatta River Catchment Group – Our Living River initiative, to make the Parramatta swimmable again. Come along, it’s free!